At exactly 11:00 hrs on 24 October, ticket sales for EHF EURO 2020 began. Within the first 24 hours 25,000 tickets were sold, 30,000 within less than a week. EHF EURO 2020 will be the biggest event in the competition’s history, with three organisers, 24 nations, six groups and 18 match days. The final weekend will last three days for the first time and will be played in a football stadium, Stockholm’s Tele2 Arena. The demand for tickets was enormous right from the start of the sale. Tickets have been available for all venues and tournament phases since 24 October. It is also determined where six nations will play their preliminary round matches, should they all qualify. The organisers, who are automatically in the final tournament, are divided as follows: Norway in Trondheim, Sweden in Gothenburg and Austria in Vienna. Should Croatia successfully qualify, the 2010 silver medallists will play in Graz, 2016 champions Germany will begin in Trondheim and 2012 champions Denmark in Malmö. The main round will be played in Malmö and Vienna, while the final is played in Stockholm’s Tele2 Arena, a 20,000 capacity stadium. When it comes to the final weekend, fans will experience Sweden’s capital as it lives and breathes handball for three days. 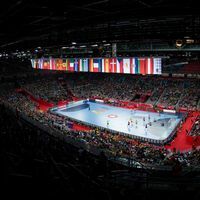 Following a unique change of the playing schedule, the EHF Executive Committee confirmed in September that for the first time, the match for third place and the final will be played separately from each other, with the bronze medal match to be played on Saturday 25 January 2020 and Sunday 26 January reserved exclusively for the final. With the semi-finals on Friday 24 January, as well as placement matches on Saturday and the final on Sunday, the final weekend has been extended to three-day handball party, which will be framed by a high-level entertainment concept. In the new schedule, the 5/6 placement match will be moved from Friday to Saturday 25 January, when it will take place ahead of the bronze medal match. Tickets for all venues and tournament phases will be available on the official website at www.ehf-euro.com. "We have had a fantastic kick-off with our ticket sales in Sweden. Already in the first week, several thousand seats are booked in all three arenas. This is way off the expectations we had before the ticket release on 24 October. "It is important for all fans and federations in Europe to secure their seats for the championship now. The new concept with the final weekend over three days is also creating lot of interest from fans and of course ticket sales. All hospitality areas in Stockholm are fully booked already, and we are now investigating additional space in connecting facilities." "We are happy that we could start the ticket sales this early so that handball fans all over the world already have the chance to secure the best tickets in the current pre-sale phase. The sales figures are very satisfying, as they already state an enormous interest of the handball community in this event 15 months ahead of the EHF EURO 2020. We are very looking forward to being able to offer day tickets and special family offers in the next month." "As the sales start in Trondheim was a pre-sale featuring six-day tickets only, the organising committee was eager to see the interest from the public. It appears we have committed handball fans in our target group. We have already sold a good amount of six-day tickets for the entire week in Trondheim. This tells us that handball fans see this ticket as a great opportunity to get the best seating at the lowest possible price, and want to spend the entire week in Trondheim in January 2020."